We present three case studies illustrating both the potential and limitations of geophysics-based site characterization and monitoring. The case studies include examples of imaging hydrogeological structures that control groundwater flow and transport, direct imaging of contaminant plumes, and time-lapse monitoring of amendment delivery. Geophysical methods can be used for both initial site characterization and time-lapse monitoring of contaminant migration or amendment delivery. Here, we present case studies showing the use of geophysics to (1) image hydrogeological structures controlling groundwater flow, contaminant transport, and remediation in unconsolidated sediments, (2) direct imaging of contaminant plumes in consolidated rock, and (3) time-lapse monitoring of amendment delivery. Geophysical methods can also be used to investigate amendment behavior during remediation. Changes to the pore fluid chemistry resulting from the addition of amendments generate large geophysical property contrasts that can be tracked with geophysical imaging. Recent studies show that microbial processes associated with attenuation of groundwater contaminants result in geophysical signatures. For example, the microbial-facilitated precipitation of metallic minerals (iron oxides and iron sulfides) can result in large changes in electrical and magnetic signatures. The Hanford 300 Area is located on the west bank of the Columbia River at the south end of the Hanford Site in Richland, WA. Underground storage of spent nuclear waste from 1943 to 1975 in the area caused uranium contamination in the groundwater. This contaminated groundwater discharges to the Columbia River through a zone of surface water-groundwater interaction beneath and adjacent to the river. Understanding how lithologic variability interacts with river stage variations to regulate exchange between contaminated groundwater and river water is a major scientific challenge at this site. The site geology consists of two main formations: (1) the upper Hanford Formation hosting the unconfined aquifer in which groundwater flows, and (2) the underlying, semi-confining Ringold Formation. The interface between the permeable Hanford Formation and the relatively impermeable Ringold Formation is a critical hydrogeological contact controlling the vertical flow and transport of contaminated groundwater into the Columbia River. Identifying spatial variability in the elevation of this interface across the site is crucial to improve modeling of groundwater flow and transport of uranium from the aquifer towards the river. The Ringold Formation is mainly divided into gravel dominated (upper) and mud dominated (lower) units. The overlying Hanford Formation is primarily flood deposits with permeable paleochannels that may serve as preferential flow paths for contaminated groundwater, locally facilitating mixing of contaminated groundwater with the river water. These paleochannels may be locally incised below the regional Hanford-Ringold contact. Figure 1. Resistivity imaging at the 300 Area of the Hanford Facility, Richland, WA. (a) location of 2D resistivity survey lines. (b) selected 2D resistivity profiles (locations in part a) showing imaging of variations in depth to the Hanford-Ringold contact. (c) Map view of depth to the Hanford-Ringold contact estimated from the electrical resistivity data, showing evidence of a paleochannel controlling groundwater discharge into the river (modified from Mwakanyamale et al., 2012). 2D electrical resistivity imaging at the site illustrates how geophysical methods aid in understanding contaminant movement (Fig. 1). The surface-acquired resistivity images readily capture variations in the depth to the Hanford-Ringold contact over 400-500 m along each line (Fig. 1b), with results that are confirmed by direct borehole observations at two locations (Fig. 1b, grey symbols). The image reveals strong evidence of a paleochannel (paleo = old) incised into the Ringold Formation (Fig. 1c). This paleochannel likely controls much of the discharge of uranium to the Columbia River. The place where the paleochannel directs groundwater discharge into the river spatially correlates with a zone of enhanced groundwater-surface water exchange determined from temperature monitoring on the riverbed. The former Naval Air Warfare Center (NAWC), located in West Trenton, NJ, tested jet engines from 1955-1998 (Fig. 2). The fractured bedrock aquifer at the site was contaminated with the chlorinated solvent trichloroethylene (TCE) during operations. The fractures and the rock matrix are contaminated with TCE and its biotic degradation products cis-dichloroethylene (cDCE) and vinyl chloride (VC). Fill, weathered silt, and silty-clay saprolite are underlain by moderately dipping, alternating massive and laminated mudstone units that contain highly fractured black carbon-rich units. This study focused on contaminated, unweathered mudstone units where the dominant flow pathways are through a series of cross-cutting faults and discrete fracture zones associated with the carbon rich intervals (Fig. 2). Figure 2. High-resolution 3D cross-borehole electrical imaging of contaminated fractured rock at the former Naval Air Warfare Center in New Jersey. Two panels of the 3D volume of earth imaged are shown for comparison. Acoustic televiewer images recorded in borehole 87BR and 85BR for comparison (after Robinson et al., 2015). High-resolution, cross-borehole resistivity tomography imaging was conducted using seven boreholes, spaced ~ 15 feet apart, drilled through 70 ft of the unweathered rock (Fig. 2). The 3D electrical resistivity tomography (ERT) image, shown as oblique slices, reveals a subsurface structure of alternating conductive and resistive layers that represent the strike (orientation) and dip (angle from horizontal) of alternating massive and laminated mudstone units. Optical televiewer logs for specific boreholes (85BR, 87BR) are shown alongside the inversion results where massive (M) and laminated (L) units are annotated (Fig. 2). Generally, lighter units are associated with less conductive massive units, and darker units correlate with more conductive, laminated units. Fracture zone intersection depths align well with layered contacts (solid black lines, Fig. 2). Fractured zones formed along bedding plane contacts between units are also visible. The largest high electrical conductivity features coincide with the most hydraulically connected units. Overall, the resistivity data provides a high-resolution view into the structure of the rock mass between the boreholes. However, these images were generated using state-of-the-art 3D imaging methods that are not accessible to most geophysical contractors. Figure 3. 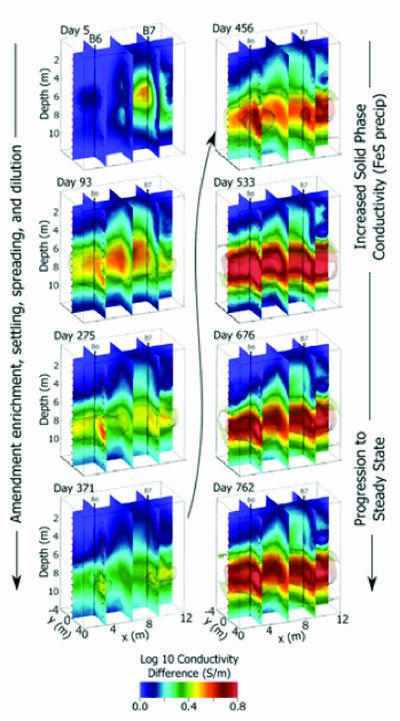 Example 3D time-lapse ERT images showing bioamendment emplacement and movement, seen as increased bulk electrical conductivity (first column), followed by later increase in bulk conductivity arising from FeS precipitation resulting from microbial activity (second column) (after Johnson et al., 2015b; from ESTCP project ER-200717). Geophysics can be used for time-lapse monitoring of subsurface processes including contaminant migration and amendment delivery. A major advantage of this approach is that focusing on variations in geophysical properties with time eliminates much of the uncertainty in data interpretation. Inverse methods (see Geophysical Methods) can be designed to directly image changes in geophysical properties over time in order to highlight fluid movement within the subsurface. The former Brandywine, MD Defense Reutilization and Marketing Office (DRMO) is an 8-acre site used to store waste and excess government material generated by several U.S. Navy and U.S. Air Force (USAF) installations from 1943 to 1987. From February 2008 through July 2008, organic substrates, pH buffers, and bioaugmentation cultures were injected at the site to promote anaerobic biodegradation and reductive dechlorination of halogenated solvents in groundwater. Geophysical imaging was conducted to validate and demonstrate the use of autonomous time-lapse ERT as an effective amendment emplacement-monitoring tool (ESTCP ESTCP Project ER-200717). Time-lapse three-dimensional (3D) imaging data sets were collected before and after amendment emplacement for approximately 2.5 years, resulting in a comprehensive ‘four-dimensional (4D)’ data set consisting of nearly 800 images. These data sets demonstrated the capability of ERT to effectively monitor the emplacement and migration of carbon substrate and pH buffer in 3D following injection. During the first year, amendment was shown to slowly sink down to a lower confining unit and spread due to groundwater flow. The second and subsequent years revealed a large increase in subsurface conductivity within the treatment zone due to enhanced microbial activity (Fig. 3). This increase may be the result of microbial induced iron sulfide precipitation. Geophysical methods and data analysis can provide valuable information for site characterization and monitoring over multiple scales. These approaches tend to be less invasive and allow imaging of areas between locations where direct observations exist. Geophysical methods are most effective when utilized in conjunction with other direct investigation methods. In this way, the significance of variations in spatially rich geophysical images can be constrained against geological and biogeochemical data at a limited number of discrete points.